The newfound asteroid 2016 HO3 has an orbit around the sun that keeps it as a constant companion of Earth. It seems the moon is not Earth's only cosmic companion. The newly discovered asteroid 2016 HO3 orbits the sun in such a way that the space rock never strays too far from Earth, making it a "quasi-satellite" of our planet, scientists say. "One other asteroid — 2003 YN107 — followed a similar orbital pattern for a while over 10 years ago, but it has since departed our vicinity," Paul Chodas, manager of NASA's Center for Near-Earth Object Studies at the Jet Propulsion Laboratory in Pasadena, California, said in a statement Wednesday (June 15). "This new asteroid is much more locked onto us," Chodas added. "Our calculations indicate 2016 HO3 has been a stable quasi-satellite of Earth for almost a century, and it will continue to follow this pattern as Earth's companion for centuries to come." Indeed, 2016 HO3 is the best example of an Earth quasi-satellite ever found, scientists said. The asteroid was discovered on April 27 by scientists using the Pan-STARRS 1 survey telescope in Hawaii. 2016 HO3's exact size is unknown, but researchers think it's between 130 feet and 330 feet wide (40 to 100 meters). As the space rock circles the sun, it loops around Earth as well, zooming ahead of the planet half of the time and trailing behind the other half, NASA officials said. 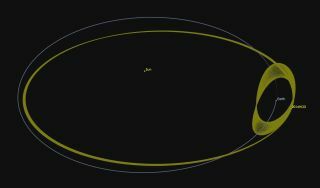 2016 HO3's orbit is tilted slightly relative to that of Earth, so the asteroid also bobs up and down through our planet's orbital plane. "In effect, this small asteroid is caught in a little dance with Earth," Chodas said. This dance is not dangerous: 2016 HO3 poses no threat to the planet, NASA officials said.